Feedback Form by © 2017 Gaspard. 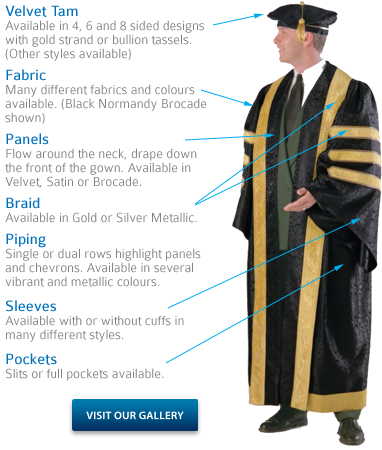 We take pride in creating custom robes for distinguished positions. Designed and made to your specifications, only exceptional quality fabrics with custom braids and trim are used. Our experienced team will work closely with you to design your special regalia. There are a vast number of options to choose from and we will help you find the perfect combination to suit your needs. Fabric samples, braids, trims and sample garments will be supplied to assist you in making your decision. Before the final garment is made a photo mock up of your robe will be sent to you for final approval. For personal service please contact Mary at 1-888-949-5730 or email: mary@gaspard.ca.